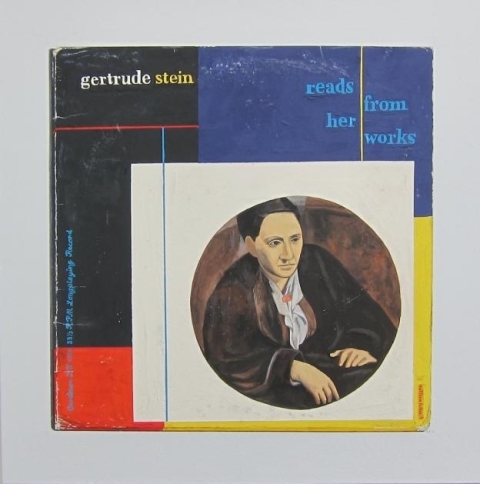 eBay prices for the album Gertrude Stein Reads Her Own Work range from $20 to $200. Vinyl purists, and Stein purists, may long for one of the still-sealed copies at the upper end of that range. The rest of us can enjoy hearing its recordings as mp3s, free on the internet courtesy of PennSound. These clips, recorded between 1934 and 1935 (which came out in album form in 1956) let you put yourself in the presence of the poet. Much of the work she reads aloud here comes inspired by observing other creative luminaries. The record's producers included these homages along with a piece of an interview, variants of well-known poems such as "How She Bowed to Her Brother" (which often appears under the name "She Bowed to Her Brother"), and an excerpt from her novel The Making of Americans. But to get straight into the textual substance, listen to "The Fifteenth of November... T.S. Eliot," her portrait of her colleague in letters. Then hear her capturing a certain well-known painter in "If I Told Him: a Completed Portrait of Picasso." And on painter Henri Matisse, she begins her remarks as follows: "One was quite certain that for a long part of his being one being living he had been trying to be certain that he was wrong in doing what he was doing and then when he could not come to be certain that he had been wrong in doing what he had been doing, when he had completely convinced himself that he would not come to be certain that he had been wrong in doing what he had been doing he was really certain then that he was a great one and he certainly was a great one." If you feel proud of reading that whole sentence in one go, wait until you hear Stein speak it. Find works by Gertrude Stein in our Free Audio Books and Free eBooks collections.